While the Brewers’ exciting postseason push, the ups and downs of the young Packers season, and what’s sure to be an unforgettable Bucks campaign have quite possibly distracted you from this fact, hockey is officially back. A new season begins tonight, and will give puckheads something to cheer for between now and the middle of summer. Even though Milwaukee doesn’t have a team or any clear rooting interest (personally, we’re pulling for the Predators and can’t justify cheering for the Blackhawks, but do whatever you want! ), the city is full of NHL fans. Thankfully, those fans have a few local places to watch hockey and cheer on their favorite team with like-minded folks. As we prepare for another NHL season, we’ve rounded up a handful of bars and restaurants that go out of their way to cater to hockey fans. We’ve surely missed a few places (please let us know in the comments! ), but hopefully at least one of these 10 spots will be to your liking. From full-on NHL destinations and official Blackhawks bars to taverns that will throw on the Wild occasionally and an arcade that backs the Preds, here’s our last-minute guide to hockey bars in Milwaukee. When 1983 opened late last year, Milwaukee got a much-needed arcade bar. In the process, downtown also gained a hockey bar. Given its proximity to where the Admirals play, 1983 decided to show its allegiance to the Ads’ parent club. According to ownership, you can watch every Nashville Predators game on one of the arcade’s TVs. We can’t think of a better way to kill time between periods than playing classic arcade games. Tucked away on a dead end block of Bartlett Avenue, Champion’s Pub has quietly thrived on the East Side for 60 years. Adding to the longstanding neighborhood bar’s welcoming feel are amenities like shuffleboard, games, and a spacious enclosed yard with games and ample patio seating. Best yet, Champion’s has long been known as a destination for hockey fans. Apparently, Champion’s primarily caters to Blackhawks fans, but you’re bound to catch other teams on the bar’s various screens from time to time. 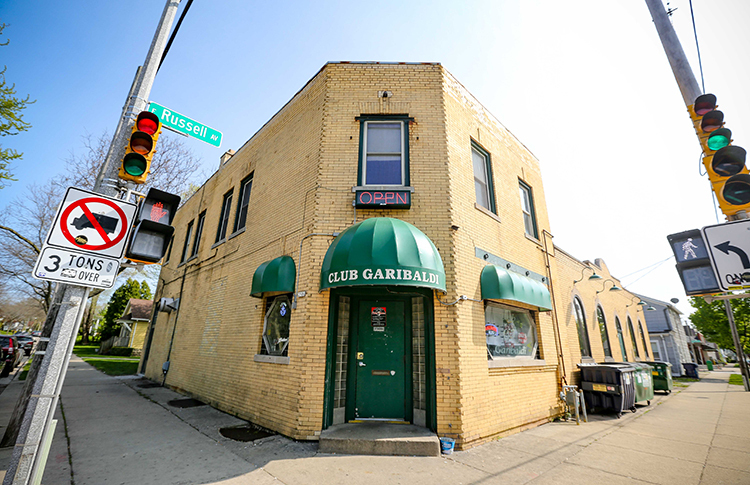 Bay View’s Club Garibaldi is known for a number of things: serving up some of the city’s best wings, hosting bands and touring comedians, and being a prime place to watch sports. Though Wisconsin sports teams get the majority of screen time, G’s also shows hockey games whenever possible. The Minnesota Wild, a favorite among bartenders, are on most often. 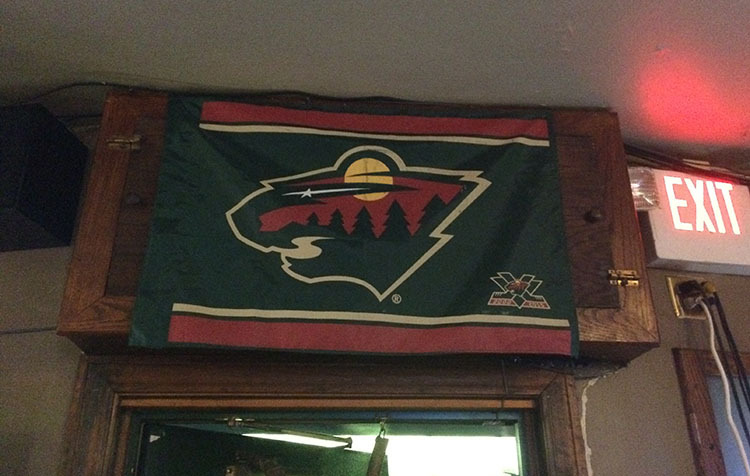 The bar even proudly displays a Wild flag above its door. Much like Club Garibaldi, Garage offers excellent food and is a great spot to watch your favorite Wisconsin sports teams year-round. It also has an awesome beer selection and a glorious new patio. Once fall rolls around, the East Side nightlife staple also becomes a satellite Nashville Predators bar. If having an out-of-market spot to watch some grown-up Admirals do their thing in the NHL isn’t already good enough, Garage also pours free shots of Tullamore Dew every time there’s a hockey fight. We don’t condone violence, but we’re always in support of a good special. For close to 50 years, Milwaukee sports fans have relied on Major Goolsby’s as a trusted place to watch a game, match, or virtually any other type of televised competition. With 55 HD televisions and split audio spread throughout three rooms, of course the downtown athletic embassy shows hockey. We can’t find any discernible rooting interest, so it’s safe to say fans of all teams are welcome. We’d recommend calling ahead to make sure your team can be put on one of the screens. You probably knew McGillicuddy’s was a longstanding spot to get food and drinks (sometimes for just $1), but you might not be aware that the downtown establishment is also a Blackhawks bar. In fact, McGillycuddy’s, which calls itself “Milwaukee’s only official Blackhawks bar,” is the only Milwaukee business listed on a directory of Blackhawks bars. Now you know! 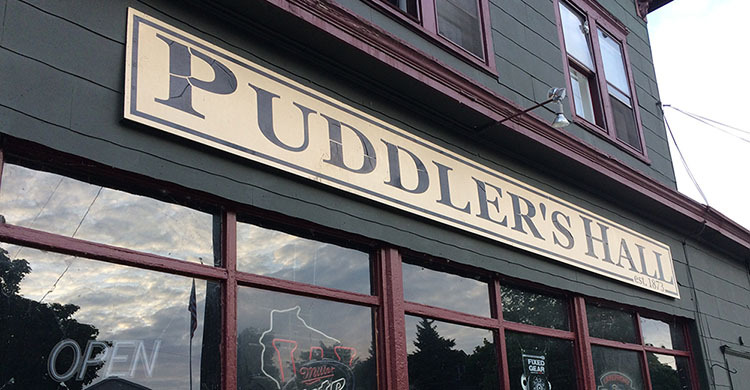 Puddler’s Hall is a Bay View treasure that will outlive us all. The longstanding Milwaukee tavern has been a trusted neighborhood tap (by a variety of names and iterations) since 1873. Though time is on its side, the Bay View stalwart hasn’t grown complacent. In fact, they’ve become quite the hockey bar of late. A bartender has made Puddler’s into a haven for Edmonton Oilers fans, but you’re bound to see some Islanders fans and Maple Leafs supporters sprinkled into the mix. Fans of all teams are welcome, but we’d advise asking ahead of time if your team can be shown on one of the bar’s roughly half a dozen screens. Romine’s isn’t just metro Milwaukee’s biggest and best pool hall. It’s also home to a Mexican restaurant…that inexplicably also serves Milwaukee’s original Coney Island hot dog. 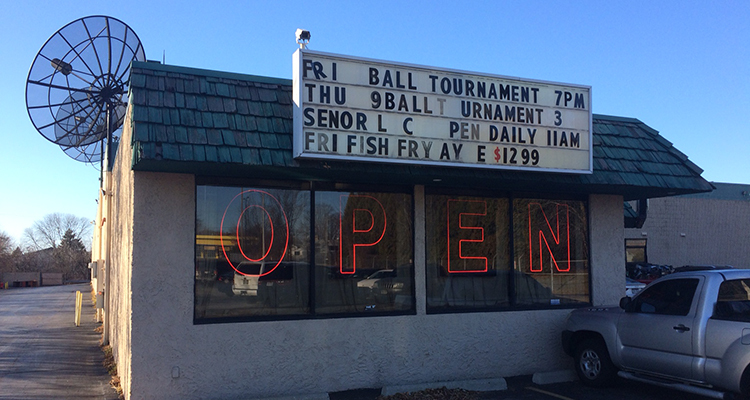 The suburban billiards bar also hosts poker tournaments, shows UFC events, and is a trusted spot to catch a game. Apparently, the multi-faceted Milwaukee area mainstay is a dedicated Blackhawks bar, too. When thinking of Milwaukee sports bars, few places (if any at all) come to mind more than Steny’s. The Walker’s Point veteran devotes shuttles and screens for every Milwaukee sports team. Moreover, Steny’s been a spot transplants can rely upon to watch out-of-market games of non-local teams. After BBC closed, they even took in the 150-some members of the Buffalo Bills Backers Of Milwaukee group. Come hockey season, Steny’s also turns into a full-fledged hockey bar. Ryan Steny tells us the bar mostly caters to Blackhawks, Predators, and Red Wings fans. However, he says they’ll use their NHL package for good by showing any game people want. Last but not least, we come to The Bubbler. 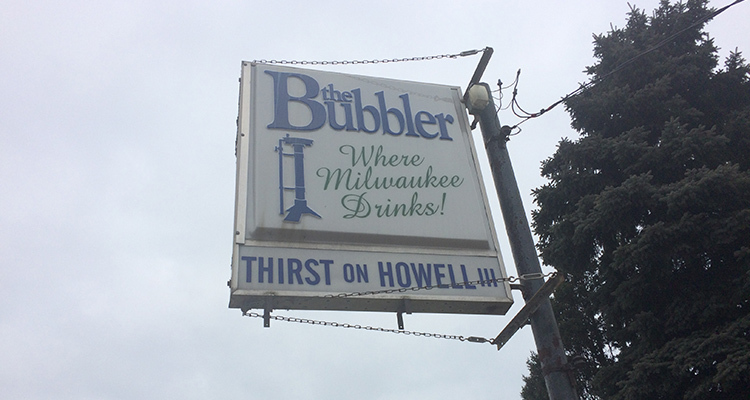 The bar on Howell Ave. “where Milwaukee drinks” has an awesome pizza place inside of it, and offers drink specials during ever Packers, Brewers, Badgers, and Bucks game. When the bar isn’t showing teams with local interest, we’re told The Bubbler is known to throw on the Wild. Come for the Vinchi’s Pizza, stay for the hockey.